Temporal arteritis is one manifestation of giant cell arteritis, which can affect mainly branches of external carotid artery, but sometimes also the great vessels at the aortic arch and coronaries. There is granulomatous inflammation of the media. 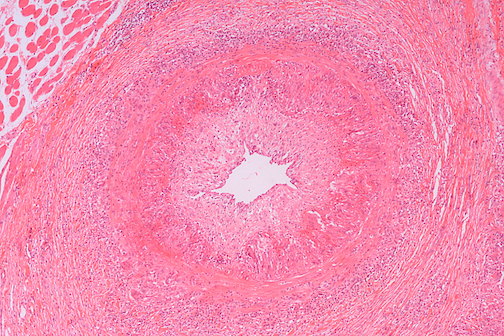 Shown here is extensive inflammation in the temporal arterial wall, leading to a markedly narrowed lumen.